I went out yesterday evening to get one more look at the first transect that I surveyed because I needed to take more accurate circumference measurements. Well, my field assistant and I walked into the glade when all of a sudden a massive leopard jumped out of a tree about 25 yards in front of us. 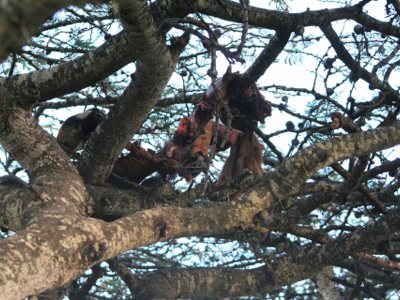 It had caught an impala a few days earlier (and actually someone had told us about it but the word was that it had left the day before) and was eating it up in the tree. Luckily it went the other way but soon after my field assistant and I noticed at least one, maybe two hyenas circling around attracted by the smell, and we decided perhaps surveying the transect just wasn’t a good idea that evening. I’m going to go out in an hour to see if things have calmed down a bit… here’s hoping!